The $244 bln retailer cranked out its 12th quarter of growing sales in a row as smaller rivals suffered. E-commerce soared 60 pct, in part sparked by food shoppers. That gives CEO Doug McMillon a leg up as the industry waits for Amazon to digest its $13.7 bln Whole Foods meal. 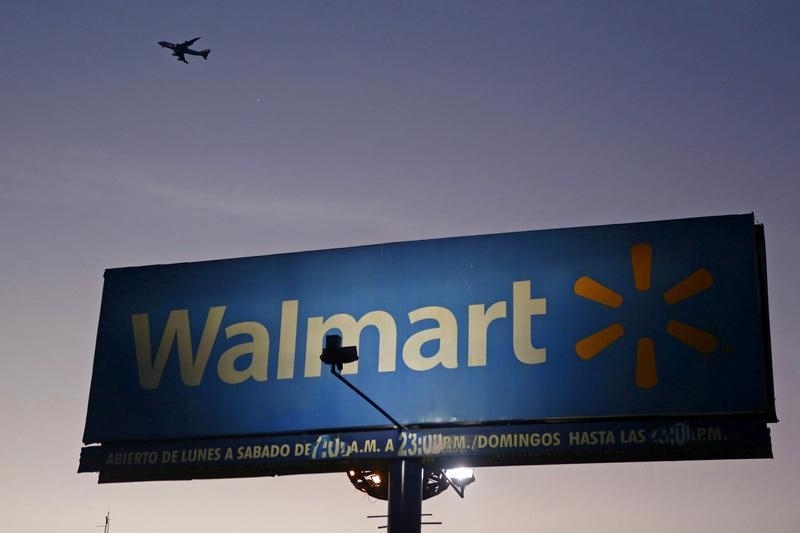 Aircraft flies over a Wal-Mart billboard in Mexico City March 24, 2015. Wal-Mart Stores on Aug. 17 reported net income attributable to the company of $2.9 billion for its fiscal second quarter of 2018, which ran to the end of July. Excluding a $798 million charge related to the extinguishment of some debt and a gain from selling Suburbia, part of its Mexico business, Wal-Mart earned $1.08 a share. That was at the top of the company’s forecast and just beat the consensus estimate of sell-side analysts of $1.07 a share. Revenue rose 2.1 percent from the same period last year to $123.4 billion. At its U.S. stores, Wal-Mart said sales increased 1.8 percent, the 12th consecutive quarter with positive comp sales. E-commerce sales increased 60 percent for the quarter.